Chuck Taylors are altogether different from your ordinary footwear — they are something special. When I sit down with this idea in mind I wanted to express a lot of things. Love, gratitude, respect and admiration being just four of those things. I wanted to look past physical appearance and get down to the “sole” of things. That’s right I’m talking about a pair of Converse Chuck Taylor All Stars. Some may question my sanity for actually writing an article such as this, much less holding such a high opinion on a mere pair of shoes. But to me, Chuck Taylors aren’t just a “pair of shoes”. Chuck Taylors are altogether different from your ordinary footwear, they are something special. Chuck Taylors have served me well, ranging from conversation pieces to Christmas presents. They’re like that one girl who lights up your life, every time you look at her you can’t help but break out into a goofy smile and your stomach feels like you’ve been on a diet consisting of only Mexican jumping beans. That’s right, Chuck Taylors really are that special, they’re unlike any other shoe. Chuck Taylors are a slice of Americana — my dad owned a pair of Chuck Taylors when he was a kid and if I have kids they’ll probably own a pair too! Chuck Taylors aren’t a trend, they are something that continues on and on, never dying. They can be seen everywhere. You’ll catch them on televison on shows ranging from reality series (“The Benefactor”), to sitcoms (“George Lopez”). This shows that not only does the average Joe wear chucks but even Hollywood celebrities wear them. How about Johnny Knoxville in GQ magazine, September of 2004? What was he wearing? You’ve got it, Chuck Taylors. Not only are Chuck Taylors classic and timeless, but they’ve endured the numerous trends, always managing to maintain their popularity. You’ll see them in prep wear and punk wear. To give a good example of the way they’ve bounced from fashion to fashion go back to the grunge movement of the early 90’s. Almost every picture I’ve seen of immortal grunge icon, Kurt Cobain, shows him sporting a pair of Chuck Taylors. And today whenever you turn on the TV, open up a magazine, or take a look at random people on the sidewalk, you’re bound to spot a pair of chucks. One of my favorite things to do when watching TV is point out people wearing Chuck Taylors, and in the approximate 30 minutes I spent watching television today I counted two people. I’m not much of a TV buff but if I were to actually sit down and watch television I know that I’d find a lot more people wearing good ol’ reliable chucks. I’ve seen people wear chucks from everywhere to rock concerts to funerals. I’ve seen Chuck Taylors worn with suits, and Chuck Taylors worn with a pair of tattered jeans and a ratty shirt. I’ve seen Chuck Taylors worn by the rich, I’ve seen Chuck Taylors worn by the poor. I’ve seen men, women, boys and girls all wear Chuck Taylors. In short, Chuck Taylors are the best shoe out there. I don’t own a single article of clothing that looks bad when juxtaposed with my black high top Chuck Taylors, and it’s a good thing too because those are the only shoes I wear! But some people may decide they don’t like chucks simply because they don’t have enough “variety”. Well, allow me to point out how wrong those people are. I’ve seen chucks in black, red, yellow, blue, gray, pink, and a dozen other colors. I’ve seen hand-painted Chuck Taylors, I’ve seen Chuck Taylors with peace signs on them, I’ve seen chucks designed like the American flag. 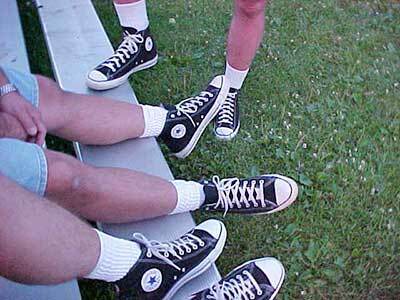 I’ve seen lo-top chucks and I’ve seen hi-top chucks, I’ve even seen knee high chucks. Yes, ladies and gentlemen there is a pair of Chuck Taylors for everyone. Do I want a nice pair of shoes? Do I want to be noticed? Do I want to save a little extra money? The answer is as simple as lacing up your very own pair of Converse Chuck Taylor All Stars.